Youngstown State women's soccer sophomore Katie Montgomery has been selected to participate in the NCAA Student-Athlete Leadership Forum, April 5-12, at the Hyatt Regency in Orlando, Fla. The Leadership Forum is a cutting-edge educational opportunity for student-athletes, coaches and administrators to engage in a diverse and dynamic representation of student-athletes, coaches, faculty and administrators at no cost to member institutions or conferences. The selected participants receive pertinent and customized sessions that enhance personal awareness and leadership skills needed to impact student-athlete development at the campus and conference level, and beyond the collegiate landscape. The Leadership Forum, created in 1997, has been a life-changing experience for nearly 5,000 student-athletes, many who have grown personally and professionally, gained a new network of peers and friends, as well as felt the rewards and importance of community service. 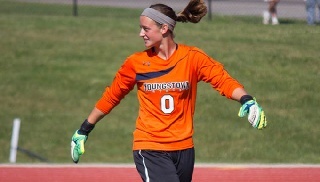 Montgomery appeared in seven matches in 2014 and posted a 2-3 record with one shutout and two combined shutouts. She tallied 27 saves and recorded a 0.96 goals-against average. She posted a season-high eight saves against Valparaiso on Oct. 11 and Green Bay on Nov. 3.